Today, human exposure to screens of electronic devices is at an all-time high. We are continually basking in blue light emitted by looking at the screens of smartphones, handheld computer tablets, laptops, desktop computers, televisions and virtual reality headsets. These devices are now ubiquitous in practically every aspect of our daily lives in the developed world. 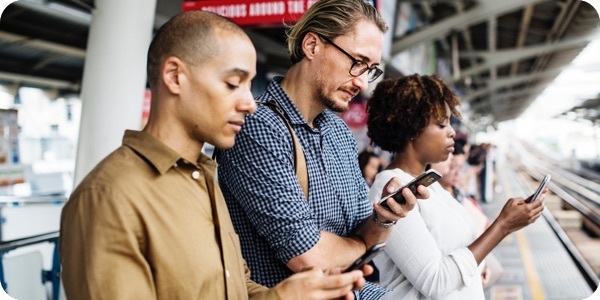 Their usage has been steadily increasing year on year since the introduction of the cellular phone in the mid-1990’s, to the point today where the average person is spending a significant portion of their waking moment sitting in front of or interacting with one type of screen or another. Following substantial research, a recent study is warning of the long-term cumulative risks and hazards to eye health due to long-term exposure to light emitted from the screen of modern electronic devices. Multiple preclinical studies have been performed with light-emitting diode technology demonstrating damage to the retina at modest exposure levels, mainly from blue-light wavelengths. Light irradiation of specific wavelengths is particularly concerning. 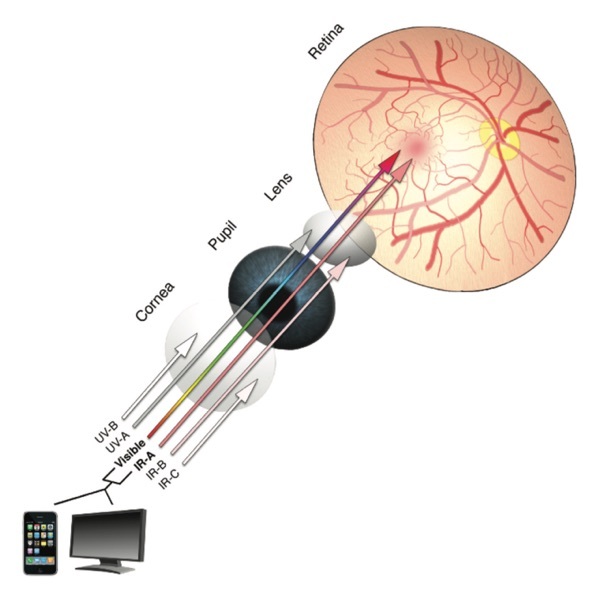 Of primary concern are visible wavelengths produced by consumer electronics as these are transmitted through the cornea to the retina, whereas ultraviolet and longer range infrared (IR) bands are absorbed by the cornea and crystalline lens. The retina is most sensitive to photochemical damage when exposed to wavelengths between 430 nm and 470 nm(Blue Light). 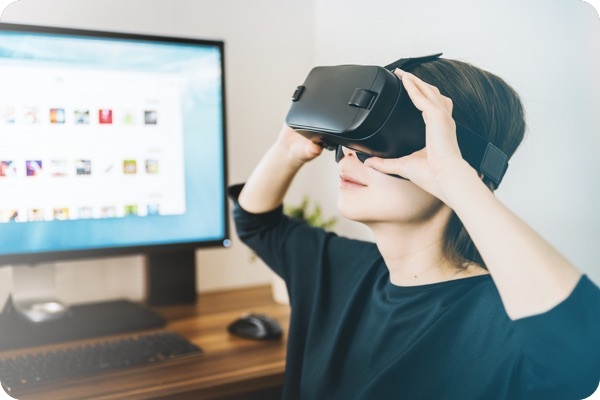 Of particular interest to researchers is the recent explosive adoption of VR Headsets and HMDs (head-mounted displays) in the last few years. Their concern is due to proximity, as the closer the screen is to the human eye, the higher the risk in terms of energy irradiation and retinal damage. In comparison to smartphones where distance, brightness and ocular engagement may vary significantly from user to user, Virtual reality (VR) systems have brought those displays much closer — within the range of 3 mm to 12 mm of the eye while also removing the ability to temporarily divert gaze from the screen. It is predicted that VR will grow from a billion-dollar industry in 2016 to between $80 – $150 billion within the next ten years and commercial adoption will spread across multiple sectors beginning with gaming and extending to school education, medicine, architecture and design. 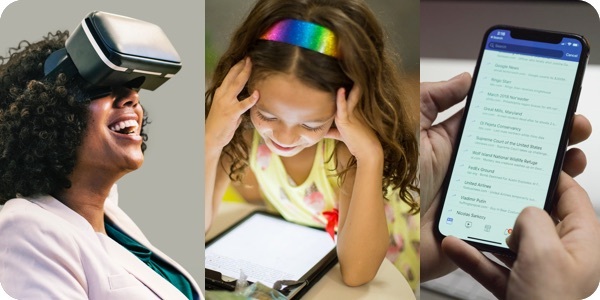 Damage to the retina caused by light toxicity is a well-established phenomenon and there now exists a growing body of information on how current display technologies, including smartphones and VR/AR HMDs, can affect the health of our eyes. The exact mechanism by which visible light causes photochemical damage to the photoreceptor cells of the retina remains controversial; however, the increased risk correlates with the intensity and exposure duration of light as well as proximity. There is ever growing interest in investigating the visual effects of these devices in the pediatric and adolescent populations. This group is of particular interest due to the increased prevalence of myopia and recognition of smartphone and tablet use as a risk factor. Both display-makers and third parties have begun to recognize the theoretical risks associated with the use of modern displays and are starting to offer methods to reduce the amount of blue-light emitted by these products. E.g. 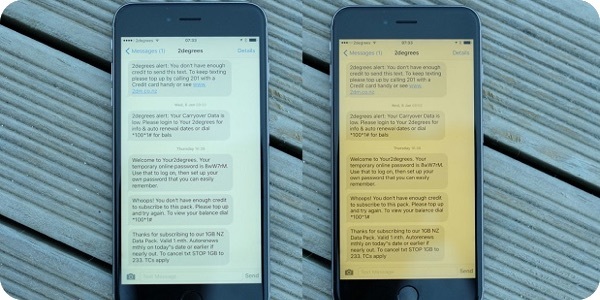 Apple (Cupertino, CA) has introduced the “Night Shift” option in a recent software update for its mobile IOS products that cause spectral changes in Apple devices to reduce blue light output. Legitimate concerns have already been raised regarding distraction, attentiveness, and potential ocular surface disease related to the use of these devices, and the more profound and potentially irreversible type of chronic, photic damage on the retina has yet to be determined. The extent of the long-term detrimental damage to a user’s vision is not equivocally known and should be more robustly studied before this technology becomes more widely adopted. Regardless of the technology studied, more rigorous, standardized studies in human subjects with supplemental visual function and psychometric testing are necessary to better understand the ways these screens impact the retina. With this information, improved exposure limits and safety recommendations can be developed.